Flying across the world like a virtual Superman just got a little more portable and touchable, as Google has updated Google Earth in the App Store with an iPad version. 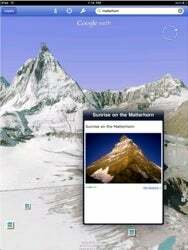 A longtime iPhone and iPod touch app, Google Earth has been updated to version 3.0 with a handful of new features. Most notably, the app has gained a native iPad version, complete with a new toolbar, a search field, and a layers popover for choosing exactly what kinds of information you want to view while you’re floating around. Google Earth has also gained a “Road layer” that works on the iPad and iPhone 3GS (and presumably iPhone 4). This is in addition to existing layer options like Places, Businesses, Panoramio Photos, Wikipedia, Borders and Labels, and Terrain. Google Earth is a universal app for iPhone and iPad and requires iOS 2.0 or later. It is available now for free in the App Store.